If there’s an opening that sums up the current high-low culinary climate in a nutshell, it’s got to be Birds & Bubbles, from Sarah Simmons, who runs the visiting-chef pop-up venue City Grit in Nolita. 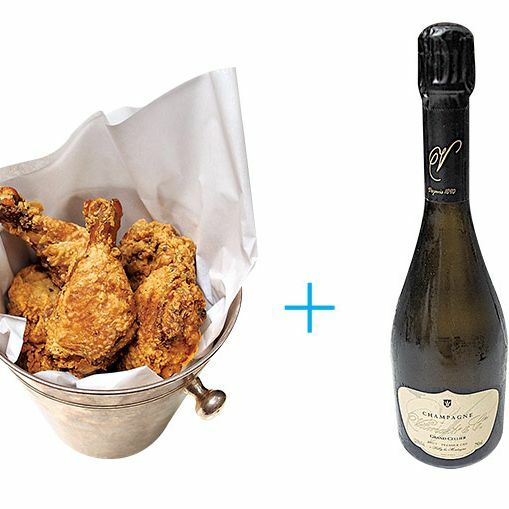 The North Carolina native’s southern menu runs the gamut from black-eyed-pea falafel to crawfish étouffée, while the whole philosophy of the restaurant is spelled out in its name—a reference to the signature buttermilk-brined fried chicken accompanied by a split of Champagne (from a 40-bottle-strong list) for $55. And why not? Even a sweet-tea addict from Alabama might admit that a good glass of bubbles with crisp acidity and a delicate fizz nicely cuts the greasy richness of that southern staple. “Champagne is one of the best pairings for food overall,” says Simmons. If you don’t believe it, just try the pimento-cheese croquettes washed down with the Philipponnat Brut Reserve Rosé. Birds & Bubbles, 100B Forsyth St., nr. Grand St.; 646-368-9420; Sept.